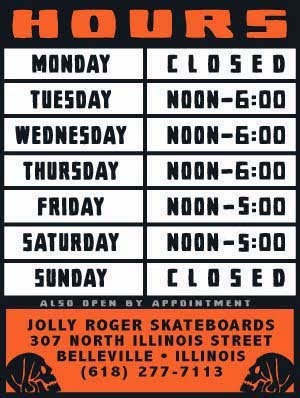 Jolly Roger Skateboards: New Decks, Trucks, Wheels, Etc. New Decks, Trucks, Wheels, Etc. Lots of new stuff in today! We have a variety of decks (AWS, Almost, Real, Foundation, Habitat, Mystery, Zero, Toy Machine, Santa Cruz, Creature and Superior), wheels (bones stf's, Paradise, Guano), trucks (Thunders, Indys, Orions, Destructos, Ventures, Industrial, Fury and Speed Demon combo packs). We also have a ton of other stuff like Stereo Cruisers, Deathwish ear buds and fingerless gloves, wax, a lot of new sunglasses, stickers, etc. *Today is the last day to come in and get a free pair of our new Jolly Roger socks if you buy a pair of shoes.